Kit includes Stainless Steel deck loop and Stainless Steel mounting hardware. 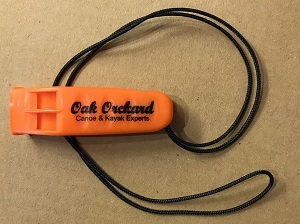 Provides a secure location to attach a locking cable to your kayak. 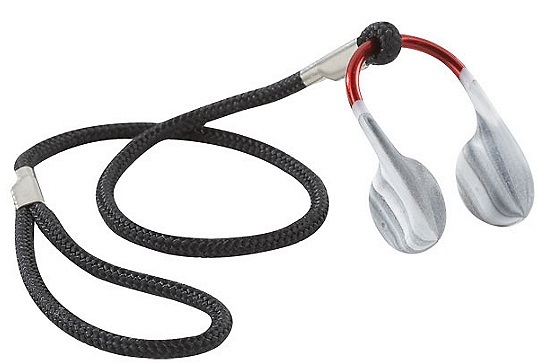 Here'a 10-foot vinyl coated steel cable that secures your kayak OR canoe to your roof rack. It can even attach to other immovable objects, like a tree or fence. That comes in particularly handy when you're camping, so you don't have to sleep with one eye open to make sure your boat won't get swiped. Unique design for canoes and kayaks! Super-flexible cable weaves through seat or other hard points on the boat and around your crossbar. Our adjustable locking slider allows you to get the length just right. Works just about anywhere you want to lock a kayak OR canoe. 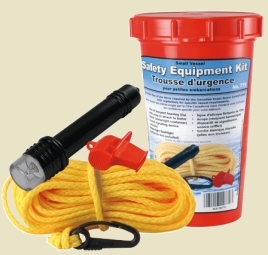 Small Vessel Safety Equipment Kit contains four items required by the Canadian Coast Guard for canoes, kayaks and small boats. Buoyant heaving line with quick clip, a bailer(which is also a watertight container), a Coast Guard approved pealess whistle and a watertight flashlight. Good idea for all paddlers to have one of these kits. The World's Finest All-Purpose Safety Whistle. Pealess designs like this are Coast Guard approved because they're Easy to blow when wet or cold. 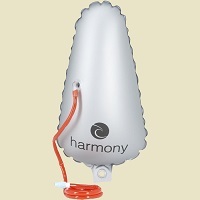 Includes Clip on back of whistle for easy attachment. 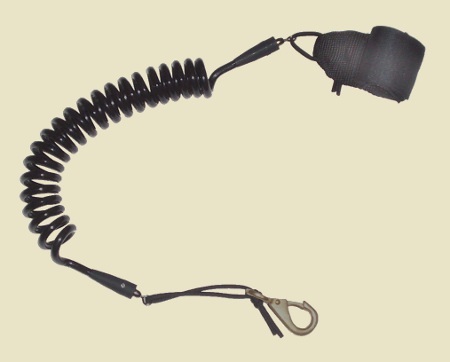 Includes lanyard for attachment to your lifevest, or anywhere for easy access. Make sure you're legal: whistles are now required for all boating... including canoes, kayaks and paddle boards. 50' x 9/32" 660lb test, 15m x 7mm 300kg test braided MFP polypropylene floating rope. 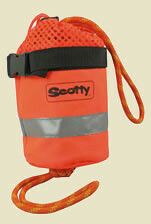 Bright orange nylon and polyester self-draining bag that comes with adjustable strap and 3M reflective safety band. Pocket sized First Aid Kit in a handy folding case. Each kit contains: steel needle (no thread), 13 assorted bandages, 1 knuckle bandage, adhesive strips, gauze pad, alcohol pad, antiseptic pad, travel towel. Oak Orchard Safety Flag will add safety to your next kayaking trip. Highly visible orange flag mounted on a 42" flag staff. Portable and mountable kayak and small watercraft light. A perfect, non-permanent safety addition. Designed to meet the demands of the sea, ideal for in a car, boat crew, campers and whenever a reliable high efficient light is needed. This unit is waterproof and corrosion resistant with a twist On/Off control that can be operated by gloved hands and in poor weather conditions. With its new attachment pin engaged to the top cap, accidental disassembly is prevented. The intense incandescent light is visible for up to two miles depending on weather conditions. The lens simultaneously focuses a beam of light straight ahead and a ring of light is present all around. This unit is waterproof and corrosion resistant with a twist On/Off control that can be operated by gloved hands and in poor weather conditions. With its new attachment pin engaged to the top cap, accidental disassembly is prevented. Runs up to 8 hours on 2 AA batteries. 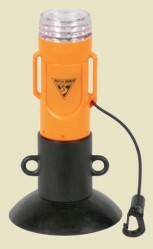 Removable light is portable and is USCG approved when attach to a life jacket. Drop down Sea Light. 42" overall height. 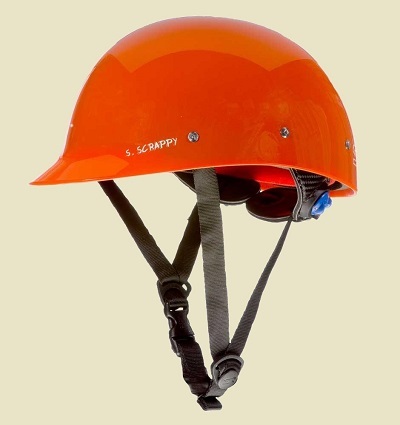 Unique drop-down adjustment, high visible orange flag with 3M reflective tape. Light is waterproof and corrosion resistant with a twist On/Off control that can be operated by gloved hands and in poor weather conditions. With its new attachment pin engaged to the top cap, accidental disassembly is prevented. Heavy duty. Good for recreation or expedition paddlers, whenever you don't want to lose your paddle. Secures your Bilge Pump on your kayak's deck where it is easy to reach. 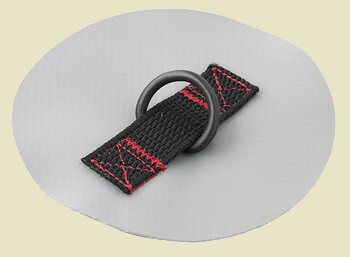 Sturdy 1 5/8" diameter nylon clip. 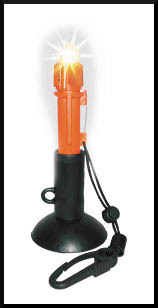 Works with many bilge pumps such as Beckson, Oak Orchard and Scotty, or any similarly sized items (does not fit high volume pump). Mount Clip to your kayak deck or you can use wood screws to mount the Clip on your garage wall and store your pump where you'll find it. 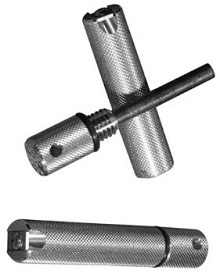 •Stainless mounting hardware (screws and well nuts) and instructions are included. The pump we've all been waiting for. More compact and powerful than conventional kayak pumps. Easy to store size (16") makes for less fatiguing strokes and innovative design pumps 30% more water per stroke. Empty your boat faster and with less wear and tear. Low profile exit port won't snag on deck rigging when needed in a hurry yet throws water well away from your boat. 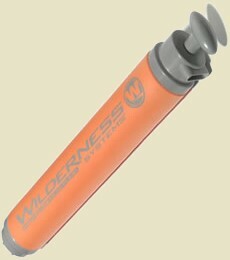 Full length foam sleeve provides horizontal top-of-the-water flotation and comfortable hand grip. Synthetic barrel and sturdy shaft means no corrosion, long life. 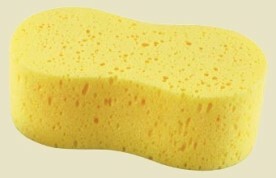 If you have a nice sponge like this you'll find you use it on a daily basis. Your boat will be much cleaner and drier too. Soft and absorbent bilge sponge; Easily absorbs over a quart of water; 9" x 5" x 3.25"
An essential self-rescue device for kayakers, the dual chambered paddle float is designed with an extra large capacity for maximum buoyancy, quick release buckles for easy attachment to kayak paddle and clip on safety tether to eliminate loss in windy conditions. Air Chambers 18.5" length x 12.5" width, 15oz. Whether paddling, sailing, camping, fishing, hunting or just changing a tire, the Hydrostar SOS SeaStar Deluxe offers an unmatched combination of features. Features include; a pre-programmed S.O.S signal, a flashlight, an emergency LED strobe light, a 360 degree deck light and a red-green navigation light. 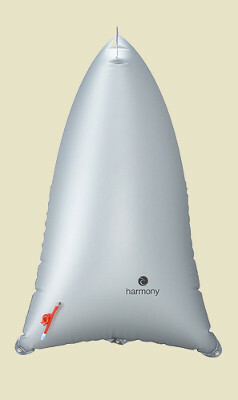 The unit can be attached magnetically or with a powerful suction cup, making it ideal for anything on the land or sea. It also comes with a secure bungee clip to help with any configuration. The combination of features and secure attachments make the S.O.S SeaStar Deluxe a must have for your watersports, travel or outdoor needs. 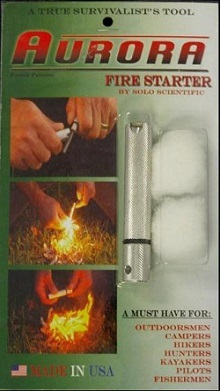 The Aurora Fire Starter 440c by Solo Scientific is a true survival tool. Regardless if you are the ultimate outdoorsman or just learning the ropes, it's super easy to start a fire with this pocket size tool. MADE IN USA. Super Scrappy is re-designed with many upgrades which make this a Stylin Lid. Designed from the ground up to provide unparalleled performance. HOG2.0 Retention System - fits behind nape of neck for secure custom fit. Sizes: This Shred Ready helmet comes with 3 sets of interchangeable fitting pads for a custom fit. Fits head circumference from 21.5" to 24.25"
Small, Medium, and Large fitting pads are included with each helmet for a custom fit. 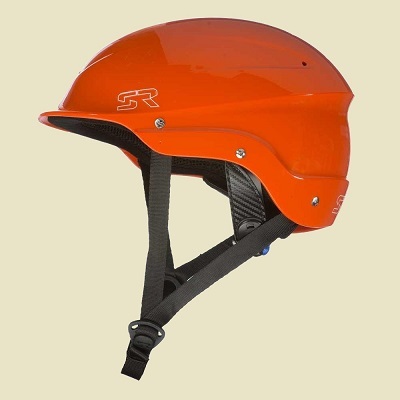 A new standard in helmet design has been set with the introduction of the latest SR Standard. Re-designed from the ground up in to provide unparalleled performance. Smiley's Nose Plugs were designed by world champion Eric Southwick. Smiley's are less obtrusive than other nose plugs for the fashion AND the function! Bendable wire frame cushioned by rubber nubs on each side allow paddler to adjust for precise fit. Equipped with looped lanyard. These nose plugs are so comfortable you can hardly feel them. 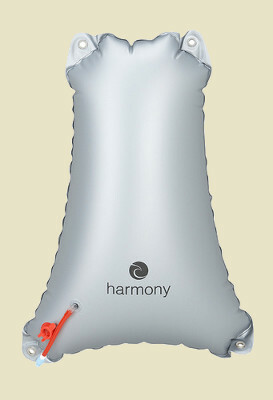 Ideal for whitewater kayakers, surfers, or anyone practicing their Eskimo roll. So comfortable you can hardly feel them. Bendable wire frame allow for full adjust-ability. Nylon cord easily loops around your helmet strap. 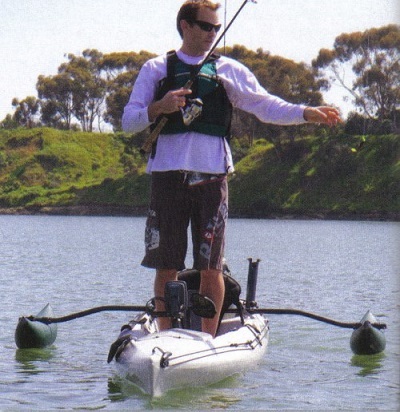 Feel secure and stable while fishing with Scotty Stabilizers attached to your kayak. 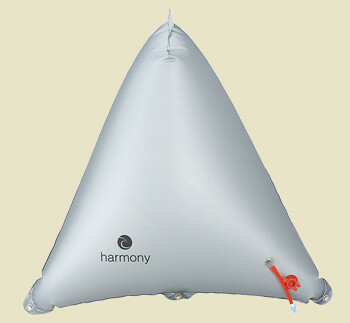 Easily inflatable bladders offer over 30 pounds of extra buoyancy and our unique assembly system makes installation and removal a breeze. This kit will add a lot of safety and stability to your kayak. EZ-on-EZ-off. Feel secure and stable in your kayak while Fishing or Paddling with Hobie's Sidekick ama outrigger kit attached to your kayak. 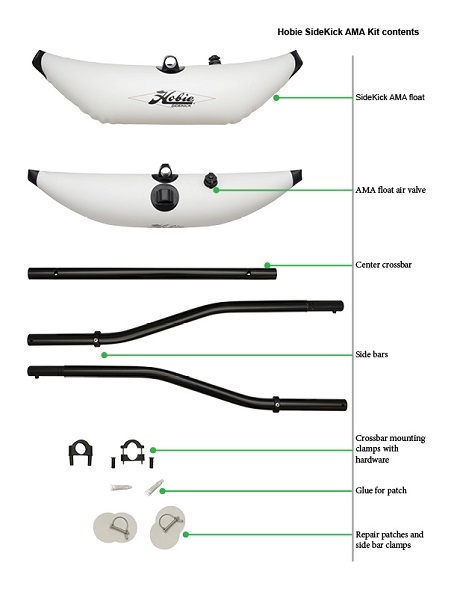 Add additional stability and safety to your kayak anytime you need it with this Kit. Great to use when sailing, fishing, hunting or shooting photos. We can easily stand-up with these outriggers on our kayak. The SideKick Ama Kit is simple to install and weighs less than five pounds. The center bar is attached to your kayak deck while the left and right sections easily removed anytime you please. No Pump Required.... The pontoon floats are a breeze to inflate. A few breaths into each float through the one-way valves. Valve caps unscrew for rapid deflation. Light Grey Color. This unit will add tons of safety and stability to your kayak. EZ-on-EZ-off. 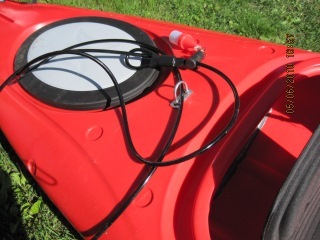 Our 54" clamp-on sponsons make any canoe un-tippable. Very popular for tippy Coleman, Pelican, Emotion and Sun Dolphin "bargain" type canoes but works well on many other brands as well. Comes complete with standard U bolts for aluminum trim canoes and (you may need to swap longer U-bolts for some thicker vinyl type gunwales). Another option is to buy a more stable canoe. You should visit our store and "Try-Before-You-Buy" -it's a great way to avoid buying less than you hoped for. End caps with security tabs that attach securely (with a screw driver) to your rack's round crossbars. These Strap Caps screw on more securely and also have a tab which prevents straps from slipping off the end of your bar. Works with WonderBar racks OR Yakima racks with ROUND crossbars. We use Strap Caps whenever our straps are within several inches of the bar end. Our original 3D Float bag is ideal for solo paddlers in tandem boats or boats designed to "go both ways." From the outset, fully outfitted with inflation and deflation valves, four isolated tie-in points, vertical 3D nose for the best fit. One Float Bag, sold individually. 60" when flat, Inflated Size: 55" x 35"
Max-bag your short boat with the 54" 3D End Bag. It provides lots of additional buoyancy and displacement at a reasonable price. Tough Vinyl construction complete with: 3D vertical nose, 4 isolated tie-in points, and inflation and deflation valves. 54" when flat, Inflated Size: 48" x 30"
All the features you're looking for in a 48" End Bag. It has a 3D vertical nose, four isolated tie-in points, an inflation hose with a twist valve and a rapid deflation dump valve. This is the bag of choice for today's open solo boats (9'-12') as well as whitewater tandems where seats are further from ends. 48" laid flat, Inflated Size: 43" x 31"
Designed for use in the ends of higher volume tandem whitewater or tripping canoes WITHOUT built-in end tanks. It features the innovative 3D vertical end seam along with tie-in points at the nose and three across the base of the bag. As with our other bags, these tie-ins are isolated from the air holding cell so that a tear out (a rare occasion at best) will be limited to the anchor. Also features a twist valve on the inflation hose and a high-capacity dump valve. One Float Bag; sold individually. 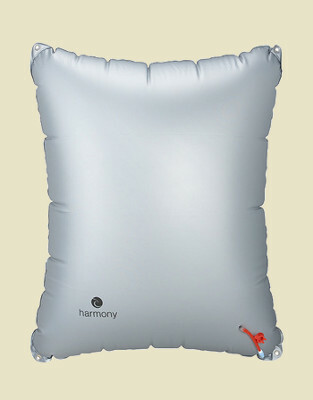 Inflated Size: 28" x 33"
Designed for use in the ends of tandem recreation or touring canoes. It features a horizontal end seam and tie-in points at the nose and corners of the base of the bag for easily secured tie in. A twist valve on the inflation hose ensures a positive seal and the high-capacity dump valve allows for easy deflation. Inflated Size: 27" x 21"
Our most versatile canoe flotation bag. Position it parallel or perpendicular to the keel line of your canoe or against the base of an end bag, maximizing buoyancy and valuable gear capacity. Outfitted with corner tie-downs, and inflation/deflation valves. Single Vinyl Replacement Stern Float Bag for a short [6-8ft] whitewater kayak. 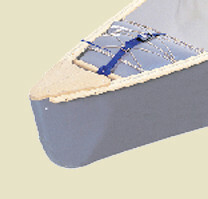 Two float bags are required to outfit the stern of one kayak. With float bags secure in your kayak it will be safer, less likely to be damaged and also easier to get back to shore -if you ever need a wet exit. Inflated Size: 27" x 13"
Single Vinyl Replacement Bow Float Bag for a short [8-10ft] whitewater kayak. Two float bags are required to outfit the bow of one kayak. 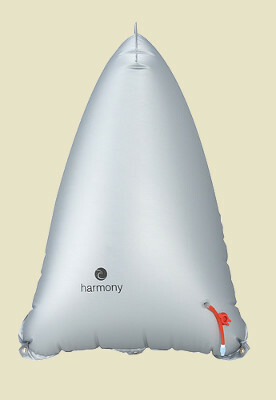 Inflated Size: 16" x 9"
Single Vinyl Replacement Stern Float Bag for an [8-10ft] whitewater kayak. 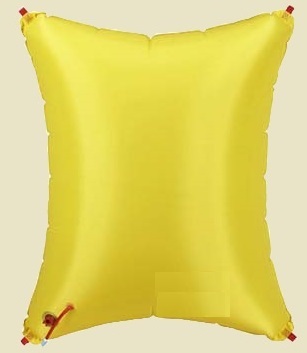 Inflated Size: 37" x 11"
Choose from three different styles. 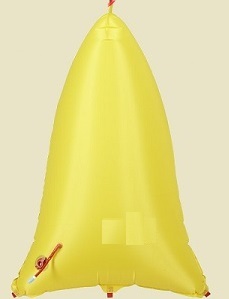 Picture of Float Bag is a general idea as to the shape of the float bag. Includes one 1" D-Ring w/ vinyl pad, Vynabond Adhesive and lashing strap. For absolute security. The Keeper Strap will keep your bag down snug against the bottom of your hull and also firmly up into the end of the boat. The Keeper Strap eliminates just about any motion or play in your bag, minimizing abrasion. Note: Center bags require an additional D-Ring(sold separately), the strap runs from one D-ring at one end of the center bag to second D-ring at opposite end of bag. D-rings provide attachment points for just about anything you want to secure to your canoe: float bags, packs and gear, spare paddles, etc. Our 1" D is built for superior strength. The D is bar tacked to 1" webbing, which in turn is secured to a heavy-duty 36 oz PVC base by a series of box stitches. The 5" diameter reinforced vinyl pad is flexible, so it can be installed just about anywhere since it will conform to the hull's curvature. Recommended for use in Royalex canoes and best installed with our Vinyl D-Ring Adhesive (sold separately). Just follow all adhesive instructions carefully and completely. The Vinyl D-Ring Adhesive is specially formulated for use on vinyl or pvc. It's a long-term UV stabilized, high strength and superior adhesion that is formulated to retain and maintain integrity in all applications. The Vinyl D-Ring adhesive has a high viscosity for optimum gap filling between bonding surfaces. 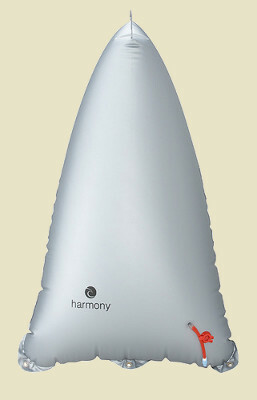 ·Begins to Harden: 30 min. ·Functional Cure: 8 to 12 hr.